10 Little Known FREE Grocery Store Services! You are here: Home / Great Deals / 10 Little Known FREE Grocery Store Services! Many people don’t realize that your grocery store may offer many FREE services that they don’t know about! Over the years I have learned of many FREE services my stores offer. 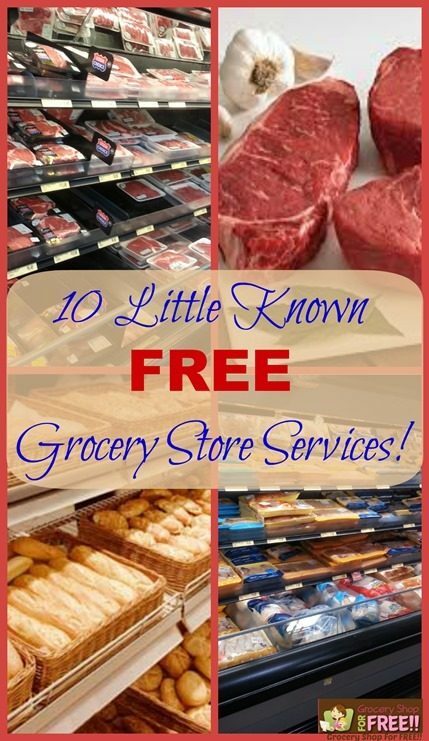 Here is a list of 10 Little Known FREE Grocery Store Services! help teach kids about nutrition. Check with your store and see if there is a Dietitian on staff and what services they offer. 2. The butcher is your friend! When my kids were young, I used to grab a cheap canned ham off the shelf and take it to the meat department and let the butcher cut it in thin sandwich slices. I would separate it into 1 lb bags and freeze the excess! I t was cheaper than the deli or the pre packaged meats and sliced thinner and lasted longer! 3. The butcher can also tenderize your meat for you, as well. Get to know your butcher and what they can do for you to make your life a little easier and dinner a bit faster! 4. Again with the Butcher! If you prefer to choose your own beef and have them grind it for you, they will do that instead of buying pre packaged hamburger meat – this way you’ll know what’s in yours. 5. The butcher can also tell you how to cook specific meats and even offer recipe suggestions! 6. Chalk up another one for the Butcher – I told you they are your friend! The butcher can trim you cut of meat for you. 7. The butcher seems to be winning here – they can cut up a whole chicken for you. 8. The deli or bakery area of your store will slice whole loaves of bread. 9. The deli will slice cheeses for you, too! 10. The Pharmacist is a great resource! They have been specially trained regarding prescriptions and over the counter meds and can tell you what to use, when to use it, and how they interact even with your vitamins! Many a night I have called the 24 hour Pharmacist when I had a sick child and they were able to help me determine if I needed a Dr. or what I could use until morning when the Dr. would be available. This is an awesome FREE resource! Most of the time these things aren’t advertised and that’s why you don’t know about them. So, remember these next time you head out to your store! We can use all the help we can get to make our lives a little easier and save us time, too, for; fr:! My friend takes a whole pineapple to the deli counter and they peel and slice it for her. Thanks! That’s a great one! I recently found out that a lot of grocery stores offer free cookies for the kiddos while you’re shopping too! As of about a month ago, our grocery store has started offering free fruit to children. They used to give out free cookies, but have switched over to a more healthy alternative. It usually has bananas and apples in it. That’s great! More stores should do that! Okay, I have to ask. I am usually friendly & outgoing, but I often become intimidated. How did you first approach this to find out this info. Also, in my area, we have 2 smaller grocers, Price Less IGA & Piggly Wiggly. Would this be available in more of a larger chain like Kroger or Publix? Or even like Wal-mart & Super Target? Any info is appreciated!!! So daunting, lol! Yes, Publix is very friendly about slicing/grinding meat, bread, or cheese. They give a free cookie to your child each time you visit the bakery counter. You just ask for a Cookie Club card and you present for all future visits. When you order sliced meat or cheese at the deli, they’ll even give you a free slice to taste. Sometimes they give it to you without asking, but they’re always happy to give it to you either way. That is so nice! I just had a reader say her hubby was treated badly at Winn Dixie for asking… :/ Glad your Publix is so nice! The butcher will usually offer free knife sharpening too. You just have to bring your chef’s knife in a sheath or well wrapped, drop it off and the next day you’ll have sharp knives. That’s a great one!! I didn’t know that! Thanks for sharing! Awesome thanks for sharing – I think I will make another one with all of these great ideas! Some butcher departments will sharpen your Chef knives for free! Dierbergs for sure does it. The deli will not slice cheese for if out of the dairy section. Only cheese you buy from the deli. They won’t slice a whole ham from the meat department either. Unless you get someone who is bored or very nice. I sliced a ham for a woman and was told the next day I could have been fired for it. It depends on the store. I have always bought canned hams off the shelf and taken it to the butcher in stores in my area and they have always sliced it. I haven’t had any issues with cheeses either. So, i am sure it just depends on your store. How do get stuff for free .